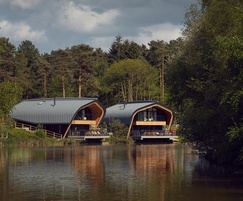 Completed in 2018, the Waterside Lodges at Center Parcs Elveden Forest are an award-winning project. 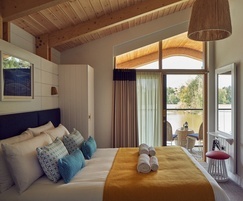 For this ambitious architectural and engineering project, architects Jackson Design Associates (JDA) designed an elegant shape for each of the lodges, reminiscent of the hull of an upturned boat with a deck and balcony facing onto the lake. The choice of building materials was an important consideration for the project. The impressive structure of the design needed to be sufficienctly lightweight in order to avoid a considerable amount of foundation work. 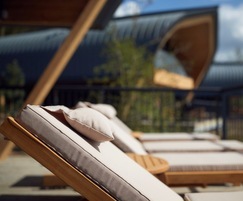 The materials also needed to complement the natural woodland landscape. One of the most challenging elements of the structure was the exposed arch at the front of each lodge, which leans towards the lake. This needed to be able to withstand biaxial bending and compression, whilst also supporting the roof structure with a large cantilever. 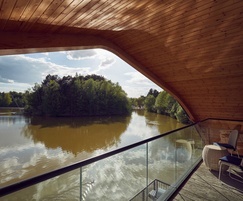 Wood was the natural choice as the principal building material, and Kerto® LVL (laminated veneer lumber) from Metsä Wood was selected as the only product that could meet all the requirements, including being lightweight, environmentally-friendly and offering fast installation. Kerto® LVL also met the fire safety requirements. Kerto® LVL's solid bonded structure offers high strength and dimensional stability, while its high strength-to-weight ratio allows for smaller spacing in mechanical connections. Kerto® LVL Q-panels were used to create the long span to the first floor deck, which was designed to bear the weight of the column horizontally with a spring support. Vertical columns were formed using two members spaced to support the first floor's beams and curved roof beams. Kerto® LVL was also used to create a recessed infill detail, closing the gap between the two vertical columns. 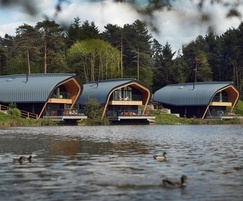 Paul Kent, Development and Construction Director at Center Parcs said: "We have been delighted to work with Metsä Wood on the supply of Kerto® LVL for our new Waterside Lodges at Elveden Forest. 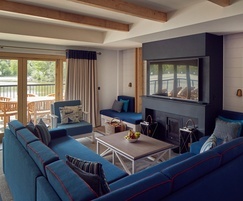 The versatility of their product has helped to create a unique design feature in this brand new style of accommodation, complementing the nautical theme and lakeside setting." 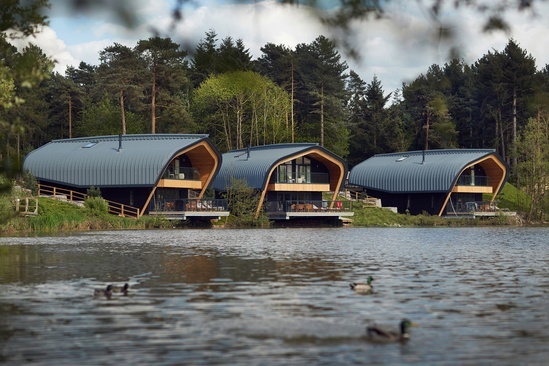 The Waterside Lodges won the 'Retail & Leisure Project of the Year' and 'Best Use of Solid Wood' awards at the 2018 Structural Timber awards.